1. High Quality And Dimmable Performance, 64×3014 SMD LED Corn Bulbs with 3000K Color Temperature. G8 led bulbs are perfect replacement for ordinary halogen bulbs. Slight Flicker, No Radiation, It can protect your Eyes. ▲1. It is common that a slight flicker may occur in the Low setting when most of appliances using ordinary dimmers. ▲2. With long lifespan, G8 LED bulbs' service life would more than 30,000 hours. ▲3. This G8 LED Bulb can used for under center kitchen lighting, under cabinet lighting and puck light. ▲4. When you turn off the LED bulbs, there maybe remain glimmer light, which is a common phenomenon and does not affect using. 2 Years Replacement Warranty. Any doubts and question, please feel free to contact us. High Quality dimmable G8 Led Bulbs with more than 30,000 hours life span. Certification: CE, RoHS.Since this bulb only generates warm white, it won't be that much bright. Coated with silicone instead of glass to protect them from breakage, works safely at AC 110V--130V. 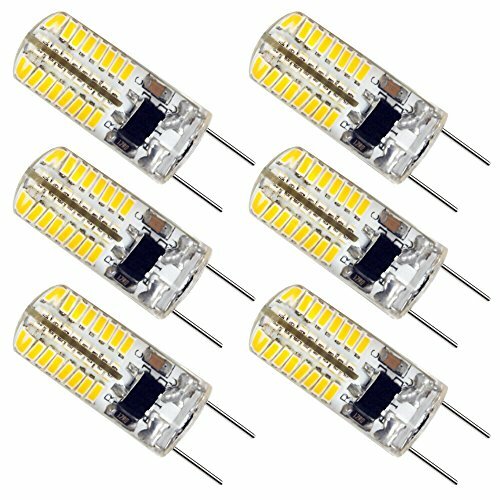 ZEEFO 6pcs standard G8 LED bulbs are perfect replacement for ordinary halogen bulbs. It can be used for under center kitchen lighting, under cabinet lighting and puck light. It is common that a slight flicker may occur in the Low setting. Warranty：2 years replacement.